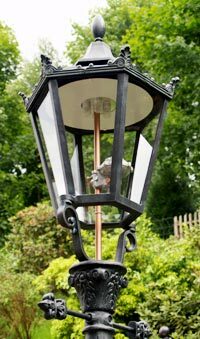 Dahlhaus Lighting is proud to present the first Gas-Light Replica with cutting edge LED technology. This light fixture has the looks of a historic Gas Lantern, from the typical technical features to the illuminating mantels housed underneath the white reflecting canopy, but the heart of a true energy saving Lantern. Amazingly, this fixture uses a LED-Lightsource with four individual LED elements that are designed and positioned to mimic the look of the historic mantels. 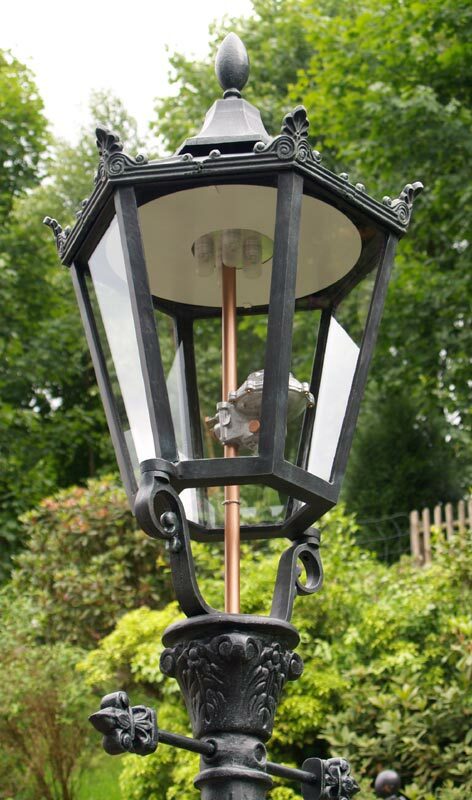 The center copper tube is used to run the wires up to the LED-Elements while the gas-regulator in the center is nothing but a simple design element without any function, which helps to complete the authentic look of this unique lantern. The LED-lights are equivalent in Light-Output (Footcandle), Light-Color (Kelvin), and overall look to the traditional gas lanterns. However, when it comes to energy consumption, this new introduction offers great savings and is environmentally friendly. Especially suited for historic pedestrian areas and parks, this light truly sets a new standard in regards to Energy efficiency, longevity, and environmental consciousness. 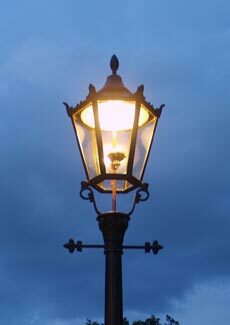 More importantly though, it truly bridges the gap between the expected beauty of a historic light fixture, and today’s requirements for efficient CO2 reducing illuminating options. This new LED-Element can also be installed in other Dahlhaus Lighting series’, like the “Baden Baden III” our Anno 1900 P3 as well as the Altstadt design. · Instantly On. No switch-on delay. User Friendly · No flickering of the lighht-source. Saves operation cost and CO2 Emission · Predicted Bulb Life of more than 50,000 hours. That’s more than 80% longer than HID. · Free of Mercury and lead.